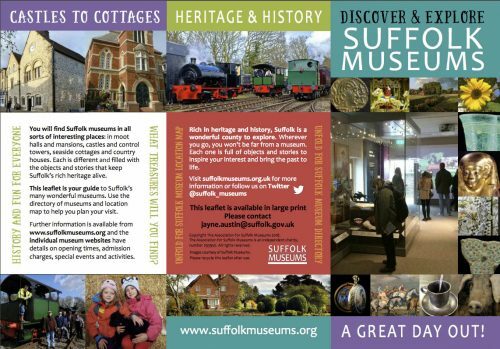 Home » News » Download the new Suffolk Museums leaflet! Download the new Suffolk Museums leaflet! You will find Suffolk museums in all sorts of interesting places: in moot halls and mansions, castles and control towers, seaside cottages and country houses. Each is different and filled with the objects and stories that keep Suffolk’s rich heritage alive. This leaflet is your guide to Suffolk’s many wonderful museums. Use the directory of museums and location map to help you plan your visit. Further information is available from this website, and the individual museum websites have details on opening times, admission charges, special events and activities.